Super Mario Bros. Turns 30 Today -- When Did You First Play? On September 13, 1985, Nintendo released Super Mario Bros. for the Family Computer (Famicom) in Japan. My first encounter with the heroic plumber came a year later at a local bar. The game that many credit with resurrecting North America’s video game industry after the Atari/Coleco era crash arrived in the states at a point when 12 year old me was perfectly content playing with my Transformers and G.I. Joes, getting my video game fix from two odd relics from the gaming boom—the Coleco Adam computer (with Atari 2600 adapter) and the Vectrex my mother bought me on clearance at Toys ‘R’ Us a couple years prior. My mother had recently moved us down to Georgia from Pennsylvania to live with her third husband, the CEO of a successful financial software company. Despite my new stepfather’s relative wealth, I’d grown up relatively poor and the idea of asking for a couple hundred dollars to purchase a gaming system and some cartridges was completely alien to me. In early 1986 the Nintendo Entertainment System was barely on my radar. So my first taste of Super Mario Bros. didn’t come from the NES, but rather from an old cocktail-style Popeye arcade machine a local bar had converted into a PlayChoice 10—basically an arcade machine featuring various NES games that allowed customers to play timed sessions for quarters. My friend Scott and I would stop by the convenience store for a Cherry Cola Slice and then slip into the bar to play Nintendo games. The bar employees never paid us any attention—we were 12-13 and basically invisible as long as we were quiet. I first played Super Mario Bros. with an arcade joystick. One button jumped, the other let me run. It was pretty amazing. Imagine my surprise a year or so later when I realized you could play the game at home with a rectangle. 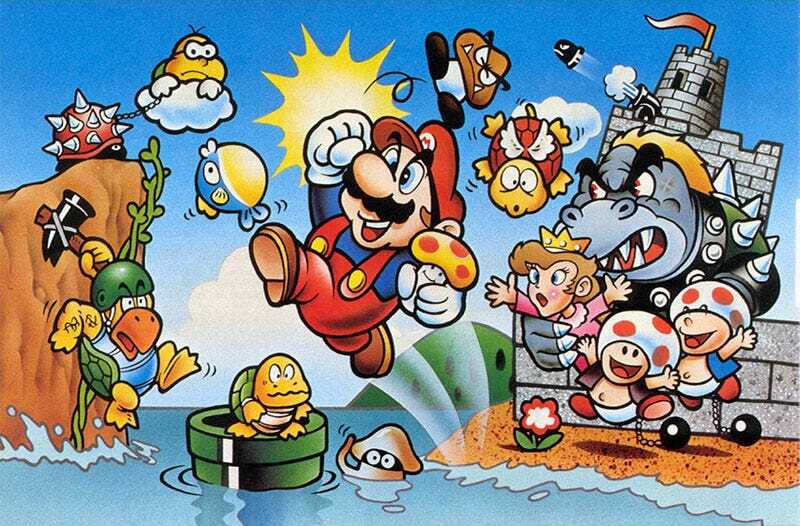 Where was your first Super Mario Bros. experience? Were you alive when the game first arrived way back in 1985, or did you play it retro-style in order to experience an important piece of gaming history, you young thing you? Share your fondest Super Mario Bros. memories in the comments below. Top image: Japanese Super Mario Bros. cartridge art, via the Mario Wiki.